People walk on the Stanford University campus Thursday, March 14, 2019, in Santa Clara, California. “The Justice Department on Tuesday charged 50 people — including two television stars — with participating in a multimillion-dollar bribery scheme that enabled privileged students with lackluster grades to attend prestigious colleges and universities. The incident, one hopes, gives upper middle-class and wealthy whites a full appreciation of what “privilege” and “rigging the system” really mean. It’s human nature to assume whatever you and your offspring have done has been earned while others got “advantages.” However, you simply cannot treat the legal advantages these parents could have provided (e.g., private schools, tutors, sports coaches, essay counselors, alumni gifts) as part of given, earned success and whatever boost an athlete or poor applicant got in the name of diversity as unearned, unfair advantage. 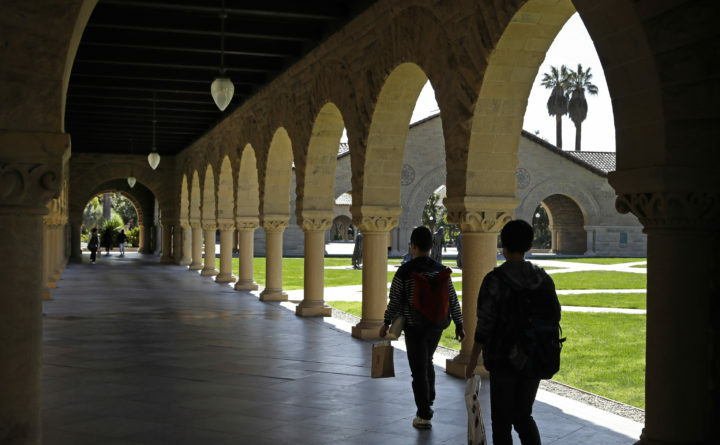 Now, rather than accusing every successful nonwhite student from an elite school of getting preferential treatment, appropriate skepticism should be directed at children of the super-rich who managed to get into elite schools despite less-than-sterling-grades. Layer on top of that the illegality and sheer chutzpah of these families and kids, the blindness (willful or negligent, take your pick) of university administrators, and you have a galling situation. It is hard not to see this as having political ramifications. At the very least, a whole lot of people would like to know what grades President Donald Trump and Donald Trump Jr. had and what donations were given to elite schools on their behalf. Maybe all politicians need to disclose gifts about a certain dollar amount to schools their kids attended. The federal government can also use its role as student-aid lender to demand more economically diverse recruitment at elite schools. Widening our perspective, the focus on income inequality must continue and consideration of all available tools (the tax code, K-12 reform, greater subsidies for four-year and alternative postsecondary education, access to child care and expansion of the Earned Income Tax Credit, etc.). There are good policy arguments to be had about how to attack the problem and which level(s) of government are best equipped to do it. It is, however, time to put away the rising-tide-lifts-all-boats myth, recognize real and substantial inequities, understand that inequities feed anti-democratic extremism, and embrace the idea that we are losing out as a country if mediocre elites get opportunities over more talented non-elites. Jennifer Rubin is a columnist for The Washington Post. Follow her @JRubinBlogger.